The kidneys are organs that process and remove wastes and medications and help regulate salt and electrolytes in the body. Most people are born with 2 kidneys. In the preadoption records, occasionally we get reports of kidney malformations, missing or non-functional kidneys, hypertension (high blood pressure) or variants in the anatomy or structure of the kidneys. One of the first questions we need to answer is how or why do we know about the abnormal kidneys? Kidney disease may initially be subtle and renal (kidney) ultrasounds are not routinely done in preadoption screening. We almost never have access to prenatal ultrasounds or imaging. So what symptoms or history led to the investigation? Kidney disease has been classified and stratified according to national guidelines.1 With specific information about kidney function, these can be used to better understand the extent of the kidney damage but often this information (urine testing, blood testing) is not available from other countries. Resources in the country of origin may be low and children in institutional care often have poor access to specialty medical care. Thus, much of the workup and final diagnosis may need to be done when the child comes to their adoptive family. Examples of mild kidney disease could be a single kidney that is not working properly or has a slightly abnormal anatomy- e.g. horseshoe kidney, collecting system abnormality, or hydronephrosis (some extra water that has collected in the kidney). Most mild kidney issues can be followed by pediatric nephrology and/or pediatric urology to ensure that they are stable or resolving over time. Occasionally, other interventions such as surgery or medications may be needed but most kids with mild kidney issues do very well in the long term. Major/severe kidney disease noted sometimes as renal failure, end stage renal disease (ESRD) or moderate to severe kidney dysfunction can be regulated by medications, home procedures like peritoneal dialysis, or surgical interventions. However, depending on the severity, some of these children may require renal dialysis, or a filtering of the blood several times a week that needs to be done in the hospital setting. Some of these children may also need a kidney transplant, which can be quite successful but also requires long term surveillance and medical management. Other kidney diseases that have been seen on preadoption referrals could be related to genetics. There are several forms of polycystic kidney disease with varying forms and severity.2 Some forms do not fully present until school age3 and without a detailed family history and further testing, we may not be able to determine which form may be presenting in a young child and these may result in more severe kidney disease later in life depending on the type. 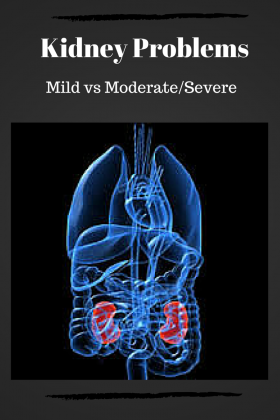 In summary, while there is always a spectrum of severity with renal issues, I usually have parents think about this in 2 categories: mild, versus moderate/severe. Because the workups are often incomplete, adopting a child with known renal issues may require a greater leap of faith. It is important to discuss and understand what your family feels ready to help with should there be significant medical needs in the future. Communication with your agency and social worker is helpful to clarify if you are comfortable with some or all kidney issues noted on a preadoption referral. *Moderate and severe kidney disease should prompt strong considerations and discussion regarding long term dialysis and potential for kidney transplantation. 1. Hogg RJ, Furth S, Lemley KV, et al. National Kidney Foundation’s Kidney Disease Outcomes Quality Initiative clinical practice guidelines for chronic kidney disease in children and adolescents: evaluation, classification, and stratification. Pediatrics. 2003;111(6):1416-1421. 2. Wilson PD. Polycystic kidney disease. N Engl J Med. 2004;350(2):151-164. 3. Fick GM, Duley IT, Johnson AM, Strain JD, Manco-Johnson ML, Gabow PA. The spectrum of autosomal dominant polycystic kidney disease in children. Journal of the American Society of Nephrology. 1994;4(9):1654-1660.